There is the first scent of new snow in the air. In the brush a few metres in front of us the excited baying of the moosedog can be heard. And a snorting: Between trunks and branches we catch only a glimpse of his black-brown winter coat. This moose, annoyed by the barking creature, sprays clouds of steam into the moist forest air. Through the brush it is difficult to estimate how big he really is. The largest deer on earth – called elk or ­moose – has no serious ­natural enemies here on the border between Norway and Jämtland. It can grow up to 2.40 meters high and three metres long here – an impos­ing beast. 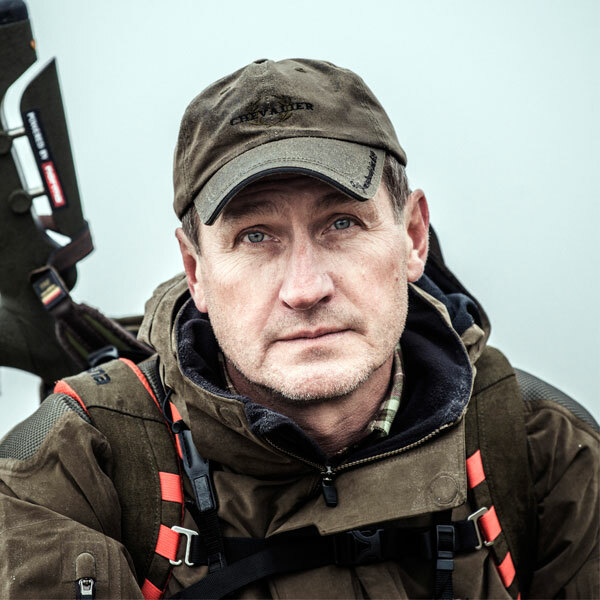 Sweden is not known for a large amount of hunting ­tourism, it is rather an insider tip says Johan Persson. In West- Jämtland he operates a 15,000 hectares hunting ground. 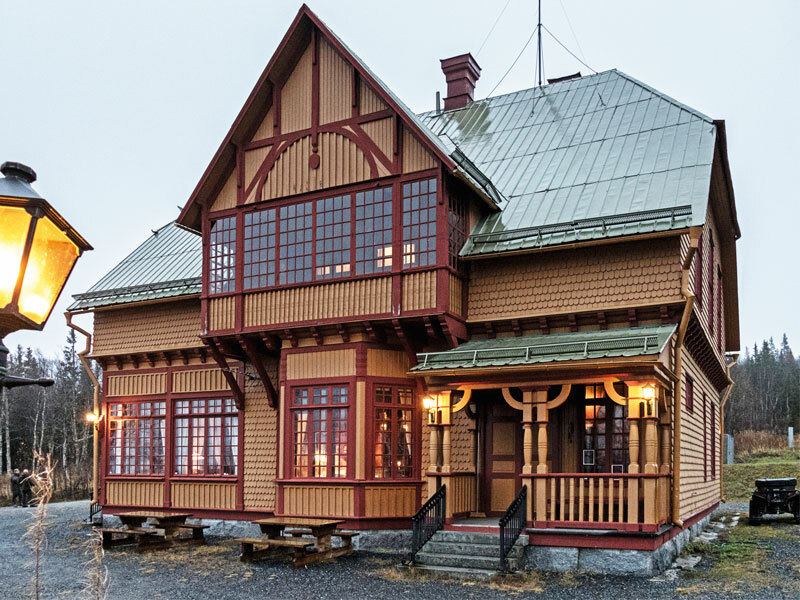 In the middle of it: Medstugan which is a small, lovingly restored hunting lodge. Only a few people live here; roads or even paths are rare so it is not seldom that a helicopter sets hunting guests far out in the mountains. Off-road vehicles are in use only to bring home game and equipment. Ptarmigan and capercaillie are hunted here – and above all elk. Population of all three: bounteous. 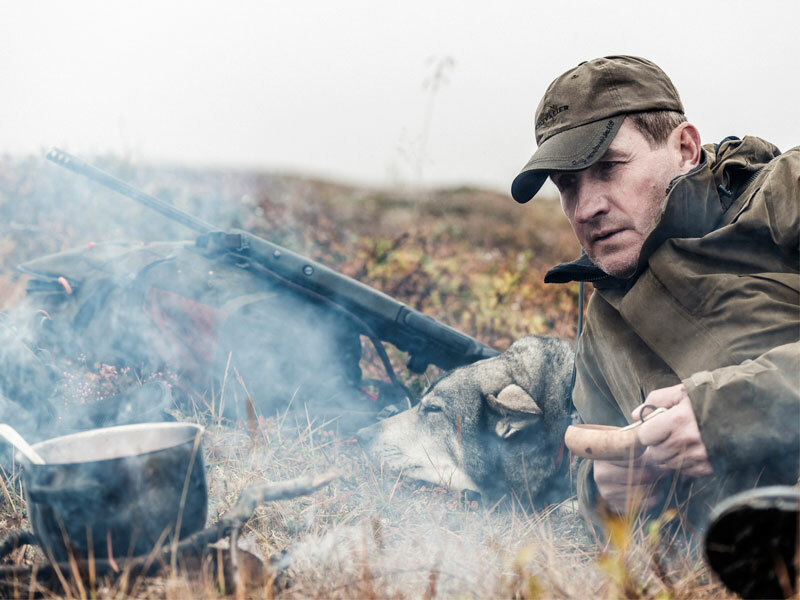 Persson is 50 and has been hunting since he was 11 years old. He studied economics and came to professional hunting by way of dog training. The jämthund, the typical moosedog in this region, is a spitz. This breed barks 70 to 80 times per minute when hunting. Because Persson‘s dog Snöa sometimes searches wide in the mountains so as to corner the elk, she wears a radio collar with a location beacon. The main precaution is not to alarm the moose. Only after the dog has the elk at bay with a rhythmic bark, the hunter follows up ­stalking with caution to get in shooting range. Moose can trot at a speed of up to 60 kilometres per hour – in difficult terrain that is definitely too fast for hunters. Hunting moose is not extremely dangerous – but in some cases you have to be ­careful: Moose tend to lash out vehemently with their hooves when cornered – fatal accidents happen in this case. Especially elk cows are known to be dangerous when raising a calf. In northern countries moose hunting has a long tradition. Swedish hunters prefer bolt action rifles – and in numer­ous households a Drilling still stands, many of them from Suhl. Persson carries a Helix with him. In a country where the number of guns a hunter is permitted to possess is ­limited, one learns to appreci­ate a universal, flexible rifle. 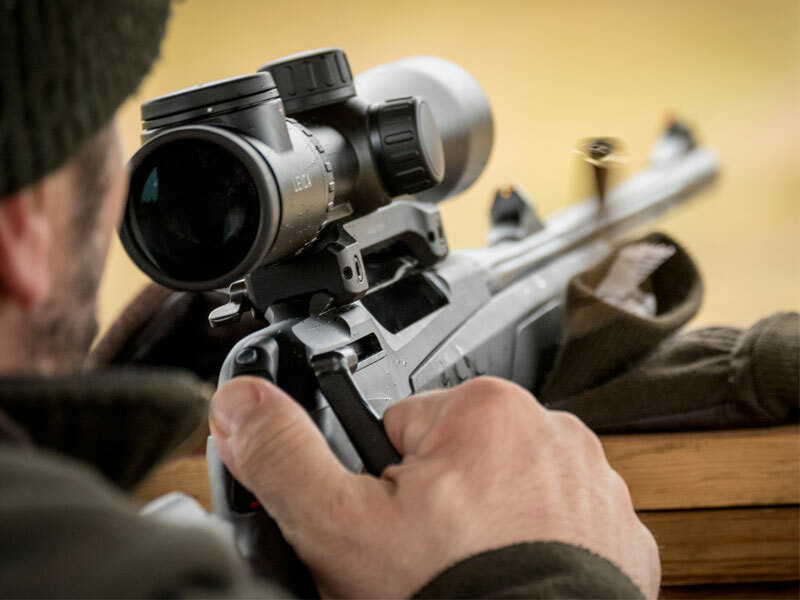 A Helix with its robust synthetic stock can be reassembled within minutes with a ­premium wooden stock when the finest quality weapons of the hunting guests at Medstugan are on show. Nothing more than an Allen key is required. In combination with the exchangeable barrels, the Helix offers a wide range of applications all-in-one. 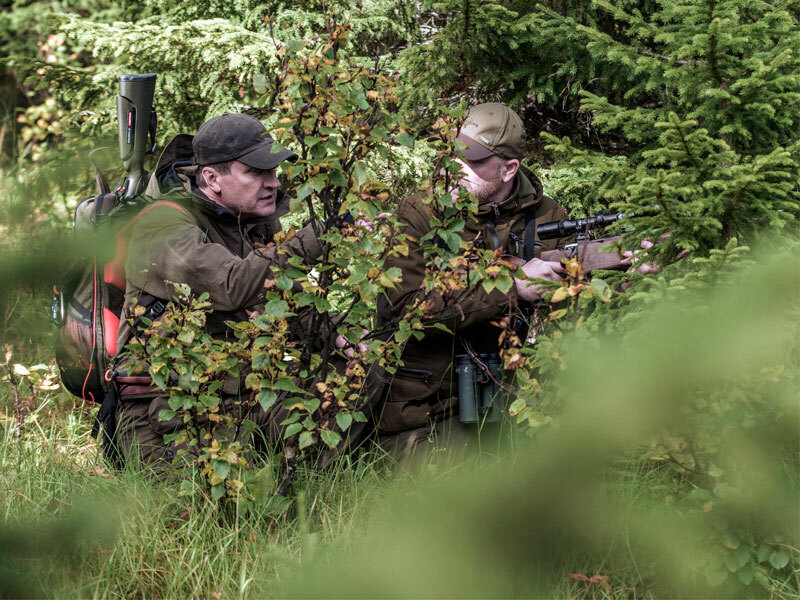 Johan Persson values the elegant and flexible linear bolt ­action from Suhl: „The Helix is light, fast and accurate.“ When on long treks through the Swedish Taiga the Helix is his constant, ­uncomplicated attendant. For hunting moose he prefers a ­medium calibre (all 30 calibres) and a variable sight. „The art is to get as close as possible.“ Snöa and Johan, are masters in this art. How did you become interested in hunting? My father started to take me out for hunting when I when I was about 7 years old. I thought it was very exciting (and cold). When I was 10 years old my father let me follow him on hunts using one of his guns. By age 11 I shot my first roe deer. That was of course a lot of mixed feelings but I was hooked and after that my life has been about hunting. I enjoy all hunts where you have to “work for it”. The harder work, the better hunt. My most memorable hunts are the once that have been very physical and difficult. I really enjoy hunting for moose in the Swedish moutains. It is a difficult and tough way of hunting. The days are long and the terrain is demanding. The moose is also very alert and using all three senses (ears, noose and eyes). You really need to have a plan A, B and C. But I also enjoy very much hunting in other countries and learn about other hunting traditions. I have strong memories from hunts on several continents. I would very much like to go back to northern Tanzania and hunt for Buffalos in the high mountains. I would bring my Merkel side by side safari express, cal 470 NE for that hunt. I also have a dram of hunting for Argali sheeps in central asia. Besides that hunting for moose in the Swedish mountains with my dog is an on-going constant dream. For hunting moose I prefere 9,3×62. For hunting abroad I prefere 9,3×62 or 7mm rem mag. For moose hunting I would recommend all 300 calibres.